Why would you #ConsiderAShelterPet? A sad but true fact is that many people have false ideas of who shelter pets are. They believe them to be emotionally damaged from past trauma or plagued by behavioral challenges that are too great to take on. Well, there’s good news in debunking these myths! 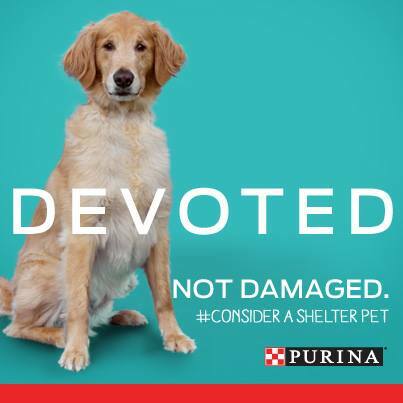 The awesome pet lovers at Purina have launched a cool program that you will definitely want to get involved with. “Meet the Real Me” is a multimedia campaign that aims to show people who shelter pets really are: they are brave, not broken; they are devoted, not damaged; they are hopeful, not hopeless. They are so many wonderful things and we can tell the world by joining together across social media with the hash tag #ConsiderAShelterPet. So, why would you #ConsiderAShelterPet?